Description: The Lancer-class pursuit craft was a patrol ship produced by MandalMotors at the behest of the Black Sun crime syndicate. 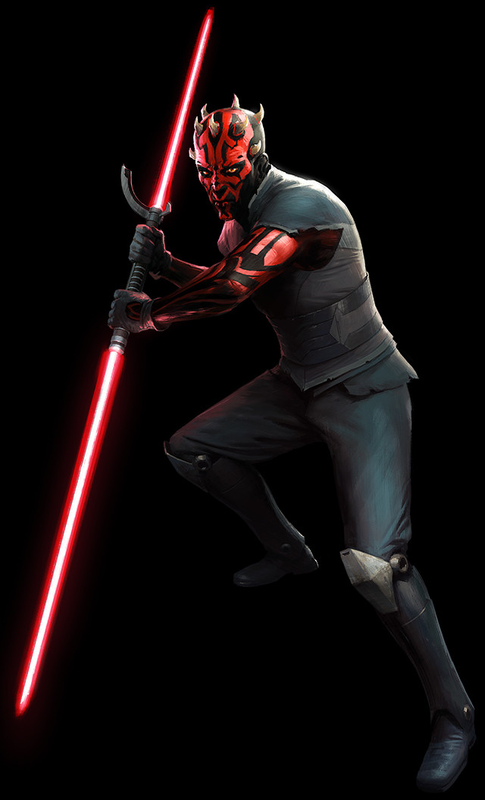 Bounty hunter Asajj Ventress utilized the Lancer-class craft Banshee during the Clone Wars, while hunter Ketsu Onyo flew another Lancer-class vessel, the Shadow Caster, during the reign of the Galactic Empire. Blurring the line between civilian freighter and warship, the Lancer was more interdiction and patrol vessel than workaday cargo hauler. Created on special commission for Black Sun by MandalMotors, the Lancer was designed to chase down fleeing cargo vessels and outrun other patrol ships. Fast, tough, and able to withstand hard use with irregular maintenance, the Lancer was able to fly, fight, and survive in the most dangerous and remote parts of the galaxy. To accomplish this, they had numerous redundant systems, and were extremely easy to maintain; in addition, they were highly modular, allowing for a broad array of modifications to fit the needs of any user. 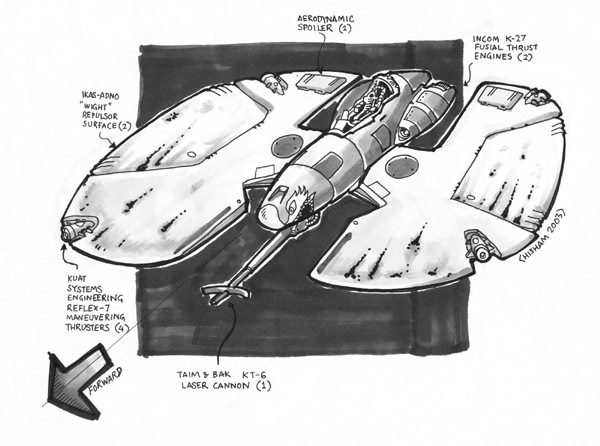 These qualities made them extremely attractive to smugglers, bounty hunters, and many backwater planets looking for a fast, cheap, and well-armed patrol ship. 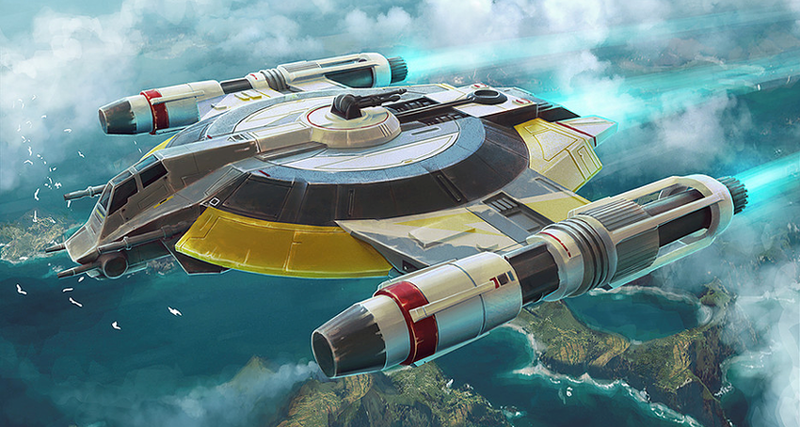 Roughly the size of a YT-1300, the Lancer-class had a thin saucer-like main hull reminiscent of many of CECs more popular ships. A narrow two-position tandem cockpit protrudes from the saucer's leading edge, and seated a pilot and co-pilot in cramped but well laid-out surroundings. This arrangement could be modified for a single pilot's chair. A bank of powerful sublight engines mounted aft provided primary thrust, while high performance ion engines mounted on sponsons midships provide additional straight line speed - enough to run down nearly anything in its class. While not as agile as a starfighter, the Lancer's speed and narrow silhouette made it a difficult target to track and hit in the heat of battle. The ship's primary armament was comparatively light, but a state of the art fire control system - the MK.IV Fire Control System - made them incredibly potent. Beyond this, the craft held a number of hard points for customization, allowing for upgrades and improvements to its systems and weapons. 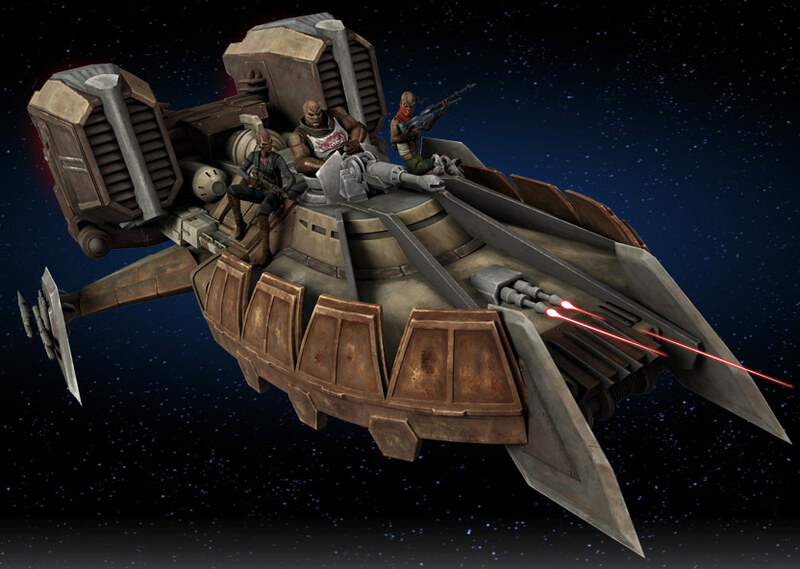 Ships of this class were deployed during the Clone Wars, most notably by Asajj Ventress who used the Banshee during her time as a bounty hunter. Years later, the bounty hunter Ketsu Onyo used the Shadow Caster.